Can’t decide between watching TV with your feet on the sofa or running a hot bath? 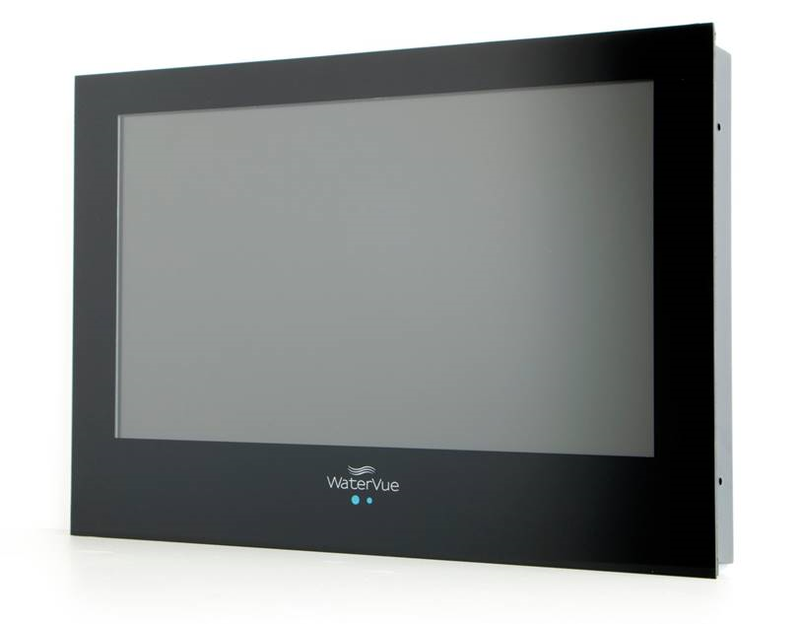 Never be torn from one or the other again with the attractive WaterVue 19 inch waterproof bathroom TV. 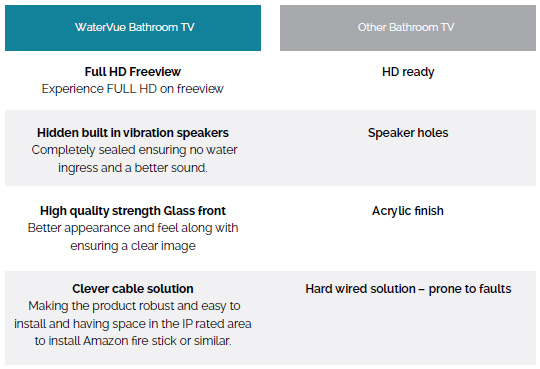 With easy installation and a safe IP65 waterproof rating, the bathroom TV is the ultimate choice for people who want a bathing experience like never before. This 19 inch LED bathroom TV model with built-in Freeview has cut-out dimensions of 474mm x 318mm x 48mm and front dimensions of 490mm x 335mm x 3mm. It’s available in numerous contemporary finishes, including black and mirror, and can be installed to sit flush to your tiles. A popular TV choice with customers nationwide, enjoy documentaries, films, sport and more in the comfort of your bath! It has integrated speakers, built-in Freeview HD and a glass (not acrylic) screen with fog-free technology, so you can run your bath as hot as you like! All of our waterproof TVs have a certified waterproof rating that exceeds minimum safety standards, so you can relax in the bath and tune in to your favourite TV shows simultaneously. 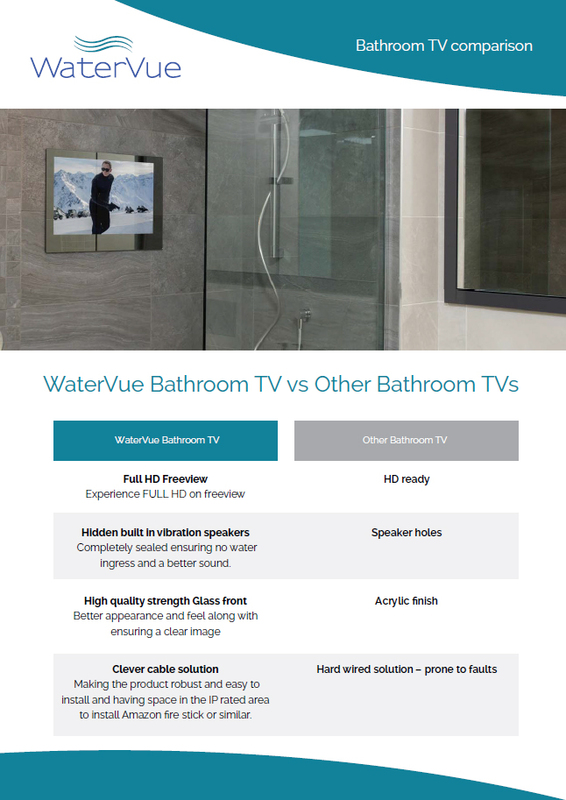 Available in multiple finishes to truly enhance your bathroom interior, the superior WaterVue TV for bathrooms can be mounted onto your wall or fitted for a contemporary flush finish that will work well with any interior design. Purchase your TV for bathroom today to get free UK delivery, or contact our friendly customer service team to find out more.